So far my summer reading list has consisted primarily of books I have stashed in the trailer over the winter months for one reason or another. A couple of these are ones I have picked up at the local library because I saw a favourite author's name - Kathy Reichs and Stephen King. Lovers of forsensic whodunnits will not be disappointed in the latest of Kathy Reich's books. A good read. 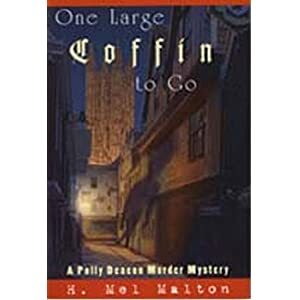 H. Mel Malton and the Polly Duncan mysteries are a new one on me but I have to say I did enjoy this. I think I'll be looking for more in the series. I love a good mystery! The Condition in the title refers to Turner's Syndrome, which stops a child's growth just short of puberty. 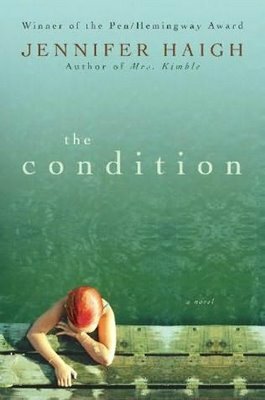 This is a good read with lots of family dynamics going on. Owen Sheers is a Welsh poet and author and this book of his was a very enjoyable read, as much for his beautiful descriptive passages and his mastery of words as the subject matter and story. The premise of the story is that Operation Overlord failed and the Germans conquered Great Britain. It deals with a tiny village in Wales where the wives wake up one morning to find their husbands have vanished during the night - presumably off to join the Resistance. The women are left to deal with keeping the farms going and dealing with the German soldiers who appear on the scene. Beautifully written! What can I say? 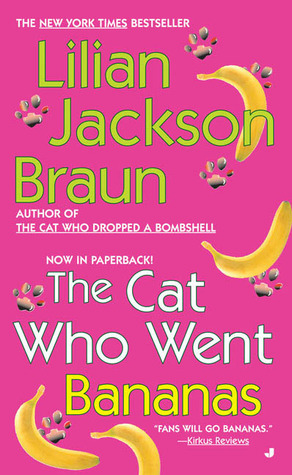 "The Cat Who..." books are a gentle read, much like the #1 Ladies Detective Agency books. Sometimes you need a book that feels like a cup of hot cocoa for the mind. I saved the best for last, at least in my opinion. I love Stephen King and his books - I would pay good money to read anything he has written, up to and including his grocery list. The man knows his craft. His characters are always well rounded and authentic and he carries you along in his tales of `what if?" This time it is what if someone could travel back in time and stop the assassination of JFK? I tried to read slowly to make it last but still managed to polish off the 800+ pages in three days. I wish it could have lasted longer. So, what are you reading? I would love to get some recommendations of good books to add to my stack for the summer! Below is the work I did on a block for Karen in one of the Fools Gold DYB Round Robins I am in. If you would like to see the finished block, scroll down to the bottom of the post. I took photos along the way this time though so thought I would show the progression of the block. These bright warm batiks that Karen pieced with threw me for a bit of a loop. This is one of the challenges of round robins - stretching and growing a bit to work on colours and designs you wouldn't usually. It only took a day or so of looking at the block though for the colours to start working with me. In the accompanying booklet Karen had a list of "likes" and peacocks were on the list and I like them too so I decided to make a paisley peacock for the block: one paisley shape for the body and three for the tail as you can see here. I used outline stitch in Kreinik #4 braid for the basic shape. I decided on a large central motif since that was what was done on the blocks already completed in her set. This next step is where most of the hours went! I chose the thinnest Japan gold thread to use because it is a six inch block and I wanted to keep things in scale. I laid down and couched the Japan gold - six circuits around each of the tail sections and the wing. Karen's booklet also indicated she would like colour added as well as gold so the next step was laying down base seam treatments in gold stitching and braid. I decided to leave the stitching on the peacock all gold since there is enough colour showing through the open areas already. Lastly I went back and added colour to the seam treatments- you will be able to see it better if you click on the photo to enlarge it. I also added a sprinkling of sequin flowers in the spaces around the peacock and added a bit more bling to the tail with sequins and beads. I hope Karen will like this! 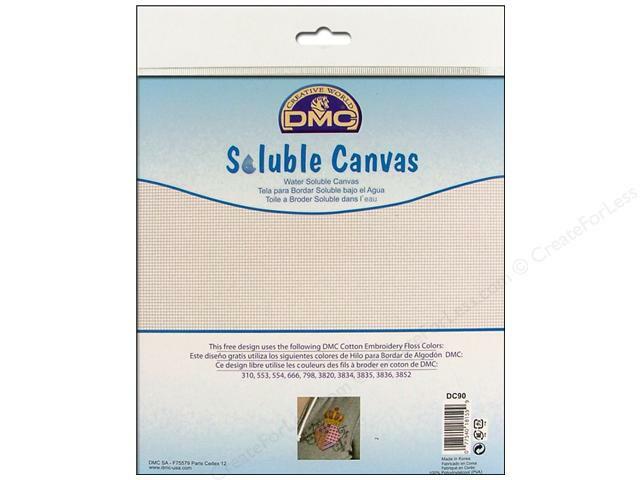 I was pretty excited when I heard about DMC's new product: Soluble Canvas. 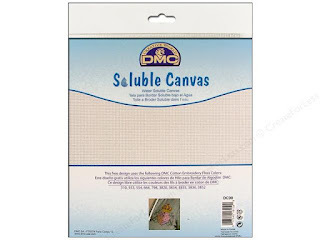 I bought some right away and tried it out to see how it would work for adding cross stitch and counted thread embroidery onto crazy quilting as an alternative to using waste canvas. The canvas is quite nice to stitch on. The holes are even and perfectly spaced so it is more like stitching on a piece of Aida cloth instead of canvas. The canvas has a bit of a funny feel to it. More than anything it reminds me of dried white glue - you know that plastic-y feel almost? It isn't unpleasant or nasty - just different. I began by cutting a piece of canvas to size and basting it on the block, then stitched the cross stitch motif, in this case a rose, as I would normally. Following the instructions, I then had to soak the piece in soapy water. Rinse lots after that to get the soap and residue out and you are done. The canvas turns soft, then into a slime and then disappears completely. So, now for my feelings on using this product vs. traditional waste canvas on a cq project. Pros: I think I got more uniform stitching and a nicer piece as an end result. If I were using this on a piece of clothing I was going to throw in the washer anyway it would be good. Cons: It is more expensive than waste canvas - you only get one small sheet in a package. Also, you can`t see the stitching as clearly against the background as you are working with this canvas vs. waste canvas. I found this worrisome in this example since I was concerned about how the shades of gold were going to show up against each other - hoping the black background would make them pop enough to be distinguishable from each other. I sweat bullets when I had to immerse the thing in warm water. I get nervous when I use a damp Q-tip to dab away water soluble markers I have used so this had me going up the wall - immersing it in warm soapy water! Had the cottons it was pieced with been preshrunk? 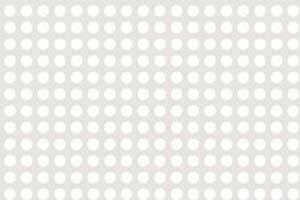 Had the muslin backing? Then when it came to having to iron it after I was worried again - what about the threads? Were all these speciality threads going to hold up under the heat of the iron? Well, everything worked all right although the rose is not as clearly a rose as I would like because of the way the shading works against the black. In conclusion, I will use the product again in other applications but not on crazy quilting work. Getting it out of there necessitated more stress on me and the piece than I am happy about. I also worry about new products like this that claim to "disappear" until they have been proven by time. Recently there were new markers on the market that claimed to "disappear" but they don't - they return with cold temperatures. Up here in Canada at least that is a concern eight months out of the year. I also think back on the sticky boards we used years back for framing needlework. In that case it turned out that the glue used on the boards attracted insects to your work over the long haul - not a happy outcome. So, maybe it is an age thing on my part that I have become very cautious over time but when you put this many hours into your stitching, do you really want to take unnecessary chances? As for myself, I can't give this a thumbs up, at least in the applications I hoped to use it for. Just my own opinions but there you have it. At last I am back to stitching and re-connected somewhat to the internet so am able to share some photos of what I have been working on. This is a block for Cathy L in the Fools Gold Round Robin. I decided to experiment with the new DMC soluble canvas as an alternative to using waste canvas and that is how I created the rose (more on my experience with that technique in the next post). 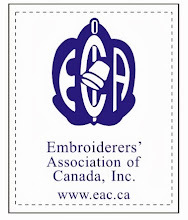 It is done in six shades of Kreinik braid and the back stitching is done in a metallic filament. The circle patch is outlined in a braid, couched down. I chose this block because of the vertical seam lines which appealed to me and my love of seam treatments - perfect place to go crazy with them! Starting on the short right seam, I used one gold colour of Kreinik #3 braid for a Herringbone Stitch and stitched Cretan Stitch on top in another shade of the Kreinik. I added trios of Detached Chain Stitch (lazy daisy) at the points of the herringbone and on the points of the Cretan Stitch I added amber flower beads. The center seam was made by making a series of five lines of small straight stitches and then threading back and forth through them with Japan gold thread, once with gold colour and once with silver colour. Trios of bugle beads were stitched down at each curve and a bead added. 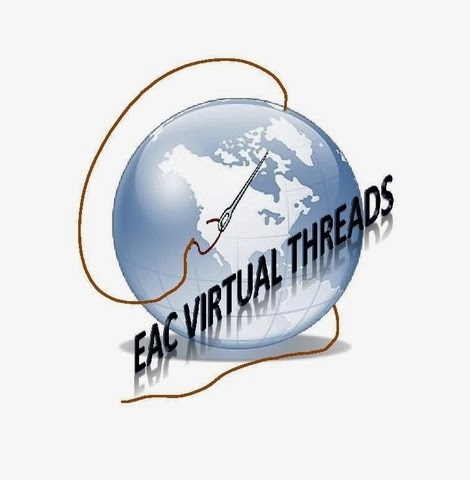 The last seam, on the far left, was started with back and forth semi circles stitched across the seam line using copper coloured #4 Kreinik braid in Chain Stitch. The Fly Stitch leaves were added on Chain Stitch branches in the same thread and placed asymmetrically wherever my eye thought they were needed. The large leaf charm is a piece of reclaimed jewellery and can be easily removed is Cathy doesn't care for it. I'm not sure of it myself. In any case, it is on it's way to the next stitcher and I hope Cathy enjoys what I've done. Although this was the 4th year for the Critter & Crafts event, this is the first time I have managed to check it out. I snuck away from the campground and arrived at the farm where it is held, 3 km. south of the Corner Store on the Milo Highway, and found myself a parking spot amid the many vehicles already there. There were over 55 assorted vendors this year and the variety of animals and items was wonderful! I didn't really know what to expect inside, but was very happy to find a wonderful array of exotic and domestic birds and "critters" along with the artsy-craftsy stuff for sale. The first thing I saw when I came in was a selection of chicken and rooster pairs in some of the more uncommon breeds. On the craft side of things I came across a display of items for sale by the Vulcan Art Society, featuring one of a kind birdhouses and garden sculptures. I am not sure of the exact technique of these sculptures but I know it involves old t-shirts! Upcycling at its best! There were piglets for sale, both regular pigs (for pork) and pot-bellied pigs (for pets). These exotic chickens are a delight - so many types! The emu chicks were intriguing... What do you do with emus?? The fair-like atmosphere of the event was furthered by a vendor who had large amounts of chicks and ducklings for sale in children's wading pools where the kids and passers-by could stop and pet or hold the little ones. The array of wonderful bedding plants, baskets and herb plants was overwhelming. I couldn't wait to get home and tell dh there were woodworking projects for sale. I had already decided this was a venue I would love to sell at in the future so I knew I could get him on board with this information..
Ladies from the local Hutterite Colony had a table of their wonderful home baking. I managed to snag the last cinnamon buns for myself as well as a Saskatoon pie for dh. This is where my money and I almost parted! I have always had a hankering for peacocks and now I know where to get them... I will definitely be back again and maybe next year some of these beauties will come home with me! If you get a chance or are in the area, check out the next Critters & Crafts event - you won't be disappointed! Yesterday I spent most of the day out at the lake with my friend Ibrahim - it was the first day of fishing season! He got a bite almost right away, catching a nice little burbot. After that we were pulling out walleye one after another. I even caught one! In five years at the lake I have only caught two fish, neither of which were "keepers" so catching one is a big deal for me. I will definitely never miss the opening day of fishing season again if I can help it. The birds were out in full force - red-winged blackbirds, yellow-headed blackbirds, Canada geese, meadowlarks, miscellaneous songbirds and ducks, and of course - the pelicans! Some day I will mange to get a good photo of these magnificent birds and I`ll blow it up and frame it. In the meantime, these two took off and flew over the other side of the canal from us. While I was out there I had to see what sort of work was waiting for me starting tomorrow. No photos of the outhouses - the pictures wouldn`t be fit for human consumption. Just let me say I will definitely be renting a pressure washer this weekend. So, I have been in a frenzy getting my trailer ready to go, my house ready to leave, and handling a hundred details such as finding a new internet provider out there. Thursday I make the move and haul my trailer to the lake and hopefully all will go smoothly and I will be back online and actually have some time to stitch in the evenings and post a bit more once I am settled. Thanks for bearing with me during this dry spell - hopefully I'll be back online by the end of the week. Talk to you soon! I finished up another of the DYB blocks in the Fools Gold round robins and just realized I had not posted it yet. The central motif was chosen from a package of requested designs in the round robin package when it arrived, all William Morris designs. I struggled with this design and then struggled to add my own input once it was on the block. Happily though the stitching got easier once the postal service brought me the Japan gold and the package of gold Kreinik braids I had ordered. The first block stitched featured a William Morris design called The Strawberry Thief - a lovely bird holding a strawberry in its beak. I added a strawberry of my own to this block to tie the blocks together. This one was made by couching Japan gold thread down. The foliage was added with silk ribbon.